I head to Thousand Tasty recently for some Shaanxi-style wheat treats. Their large selection of Chinese hamburgers (e.g., rou jia mo), pancakes, and hand-pulled noodles tempted me, but I only had stomach space for one dish and got the their lamb soup. 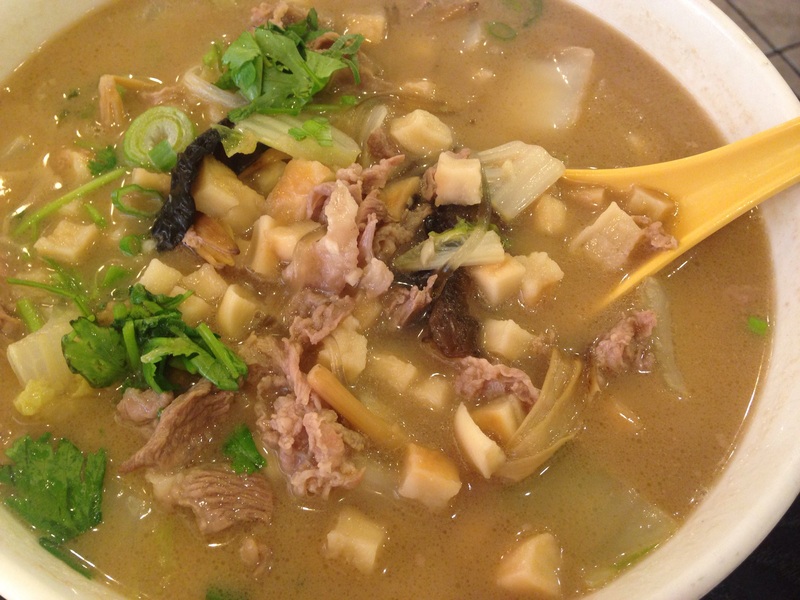 It contains soft slices of lamb, wood ear, cabbage, lily buds, scallions, glass noodles, a savory milky broth, a little ginger, and your choice of wheat accompaniment. The server said that the less traditional accompaniment was a pao bing, a layered pancake kind of like a green onion pancake. I went the more traditional route and got the “pita,” aka paomo, a big disc of bread that they chop up and put in the soup. The paomo is dense and resilient. It reminded me of the stirfried flower balls (chao ge da) at Beijing restaurant. I’ve read that pao mo is an ancestor of noodles, and it is tough to see why anyone would feel the need to invent something new – – the paomo both absorbs the flavors of the soup and retains its chewiness, even in my leftovers the next day. Great. It sounds like you have a great experience. I don’t live in SF, but I visit there often, so maybe I can visit it next time. Would you say this is a Xian (西安) restaurant? People may try to promote pao mo by saying things like this, but historical record would put noodle older. Moreover, the two items are made quiet different. Pao Mo is made from flour to bread through yeast and baking. Noodle is made from flour into noodle by without neither…etc. The processes are different. Heh, you caught me mid-edit— I was revising my post to say it’s a Shaanxi style restaurant I don’t know where in Shaanxi the chef is from, but it’s possible Xi’an. The server said they make hand-pulled noodles ( la mian 拉麵) but not the wide variety, because those come from another region of Shaanxi. The technique is different, but I didn’t realize that wide noodles ( Che mian 扯面 aka 拉片 Lapian aka ripped noodles) or Biang Biang noodles had a regional affiliation within Shaanxi. Edit: Milpitas is a schlep from SF! I’d recommend the version of this dish at Terra-Cotta Warrior, a Shaanxi style place in SF. The owner of TCW told me he uses a different ratio of flour to water for the paomo compared to the buns for the Chinese hamburgers, but the same flour, and the disc is much bigger. You are an expert in these Northern dishes. I would further seek your advise when I come to SF next time. I, too find it odd that that they would characterize wide noodles as “regional” within Shaanxi since they are so closely associated with Xi’an, the capital and by far the largest city of Shaanxi. Maybe the noodle maker is from or from near Shanxi province, known for hand-pulled noodles and shaved noodles etc. but no wide noodles. Incidentally, Thousand Tasty’s Chinese name (仟佰味肉夾饃) means “Thousand tastes roj jia mo.” Did you try the rou jia mo there? BTW, you are on the mark about noodles preceding breads (in China). The oldest alleged noodle was about 4000 year old noodle and made from millet. That precedes written records or breads in China by hundreds of years. My comment about paomo coming before noodles is something I picked up in a book I’m reading, Jen Lin Liu’s “On the Noodle Road.” She says that, Chinese written records of breads preceded mentions of noodles by a few hundred years (noodles were originally called tang bing, or soup bread). I got the impression in her book that cooked bread in soup came first, but in an interview , she says that pieces of bread dough (mian plan) were tossed in boiling water. Thanks much for the report. I may be over in that area this weekend and love me a good rou jia mo. Hey, in today’s world, a lot of people say things they have no idea about. Clearly you know your stuffs.